In 12-inch skillet, cook ground beef and onion over medium-high heat 5 to 7 minutes, stirring occasionally, until beef thoroughly cooked; drain. Stir in sugar, oregano, chili powder, kidney beans, tomato sauce and corn. Simmer 10 to 20 minutes, stirring occasionally, until sauce is desired consistency. 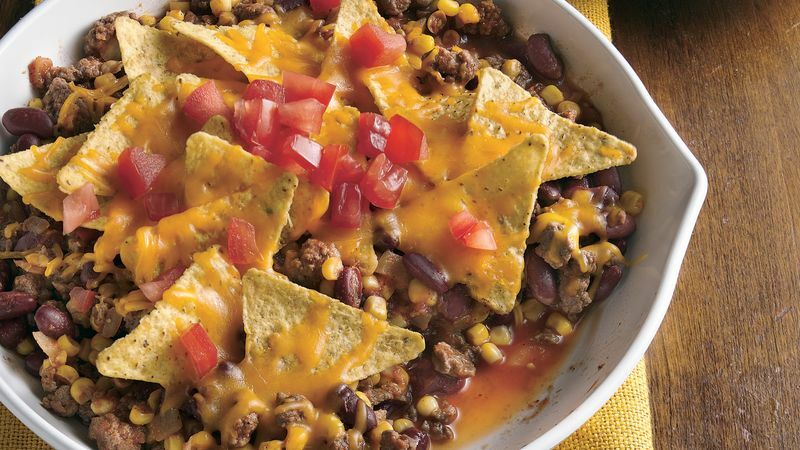 Sprinkle tortilla chips evenly over meat mixture; top with cheese. Cover; simmer 2 to 3 minutes or until cheese is melted. Serve immediately. For a little added flavor and spice, increase the chili powder to 1 teaspoon. For a pretty presentation, sprinkle the top of the skillet meal with the tortilla chips and sprinkle with the cheese. Then, top with chopped tomato.